I wanted my first movie in theatres this year to be a good one just because I believe in resolutions and unicorns and flying pigs and realised I'd wasted too much money on watching some real gobar movies in 2013. But no-way-ho-zay is that happening this year. I need to save money to spend on beer and travelling, in that order. Given how amazingly mind-blowing sequels seem to be nowadays,my expectations from this movie were as high as the roadside pandits in Haridwar. Kidding,that's not the real reason why I had high expectations, cos roadside pandits in Hardiwar are high for real and bollywood sequels give you the worst downers without ever getting high in the first place. Real reason for such expectations was because of that man in the list of my favorite movie directors - Vishal Bhardwaj. I've said this before and will say it again till hopefully Mr.Guy-From-Meerut reads and acknowledges my compliment; VB is the Modern Day Desi Shakespeare. If Shakespeare could resurrect,he would right now to personally present a Nobel Prize to VB for capturing the essence of stage drama and having the talent of moulding it into a perfect movie. V.Bhardwaj experiments and he experiments well. Firstly,you feel good if you're a part of that "niche" audience who gets his drift,his movies,his songs,his bholi si surat aankhon mein masti door khadey sharmaaye. Secondly, if you analyse his films,you'll get why I'm saying he's the Modern Day Desi Shakespeare. V.Bhardwaj plays out his stories thematically. There are various recurring themes and they're in consistency. The dots are all connected perfectly well to make a beautiful web instead of an entangled mess(which Arbaaz Khan,Farah Khan & Kamal R Khan are competing the number 1 spot over). Thirdly,I love his sense of music. I'm not saying Dedh Ishqiya had the most awesomeshizzles legendary music you'll remember and compare it with of R D Burman. Sometimes,the songs aren't exactly the kind of soundtrack you'd be checking out on a random day,or let alone even remember. Lekin,magar,parantu,kintu, his music gels well with the storyline. It's custom-made,a perfect tailor-fit. Lastly,I love his dark,twisted,witty humour . He knows his subjects,he has a good command over the language and he knows how to perfectly blend the two, i.e. imbibing that sense of humour into his characters. He probably got that humour from his cultural roots. UP does that to you,makes you funny without even you realising. It's like one of those vaccinations we get every month from our gharwaleys. Look at Kumar Vishwas. That's another story his punchlines have now become controversial with velley activists who are on snooze mode most of the time. Or perhaps the fact that he stayed away from commercial cinema. Coming to Dedh Ishqiya, this movie is immensely gratifying to the soul. It outdoes its prequel, has too many punchlines that you wanna note down just so that you can throw them at people's faces and look all cool and badass. The chemistry between Naseerudin-Arshad, Arshad-Huma,Madhuri-Huma,Madhuri-Naseerudin is ekdum 555 wali pataaka chai. Especially Naseerudin-Arshad! Unlike many sequels, there was no forced humour nor dragging emotional senti chutiyapa in this movie. The storyline's a taste of smooth lager, which gives you more and more kicks as you down more and more pints. The comic timing of every actor apart from the four main leads, i.e. Vijay Raaz(Jaan Mohammed), Manoj Pahwa(Italwi) and Salman Shahid(Mushtaq) was as perfect as Leonardo Dicaprio's gelled hair in Wolf of Wall Street. The music, while it isn't as catchy as was of Ishqiya, compliments the storyline. 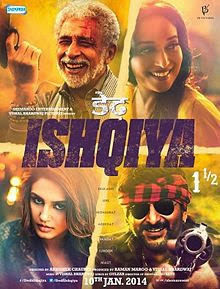 Abhishek Chaubey, director of Ishqiya and Dedh Ishqiya, did an even better job in directing this sequel, working upon the minor hiccups that were perhaps unsorted in Ishqiya. The Chaubey-Bhardwaj duo seemed to have worked wonders. Clearly, they understand each other like soulmates. Madhuri Dixit was quite a surprise for me as firstly, I expected her role to be raunchy rather than graceful and where there's grace,there's Mrs Dixit-Nene. If you asked me to name one favourite scene in the movie, I don't know which one would it be. But I can tell you the one I was clapping and hooting the loudest on was when Arshad sings "kaatey nahin kattey.." to Huma,watch out for the 2nd last line. It was simply HILARIOUS. Double-seeti-maar to Bhardwaj,Chaubey & Gulzar,the team behind the screenplay! Perfect Direction, Consistent Cinematography(Ishqiya-Dedh Ishqiya), Well-Written Screenplay, Well-Delivered Performances, Complimenting Background Score & Smart Editing. The movie captivates you from its first scene till the end. It finishes the way it begins and I loved that! This movie is a MUST-WATCH in theatres! Oh trust me you won't be disappointed! Go for it! (: Hi-5 on being a fan of VB too.